We continue our discussion and analysis of the black-ops insider notes in the “Case for the UFO” book, and unravel the story of two warring ancient civilizations on Earth! One way to read this book is to ONLY read the margin notes from the black-ops guys. If you do, a strange case emerges. This Zion document is usually discredited as a fake, intended by Hitler to incite anger towards Jews. Nonetheless, the principles in said document clearly demonstrate a great deal of thought about treating society as a giant machine, and engineering social conditions to get people to follow the will of the elite. If there is any truth to it, you might find more of a reflection of the thinking of the real authors of it than of the group they allegedly designed it to attack. Anyway, talking down about people not on the ‘inside’ is a standard thing you come across in genuine insider materials like this. With the secret knowledge often comes a sense of superiority. As you read through the notes, you also see lots of content associated with the Global Grid concepts I have written about in each of the Convergence books — “sheets of diamonds,” et cetera. There are also fascinating statements about anti-gravity and observations of the Philadelphia Experiment. It is clear, from more than one location, that “L-M” means “Little Men” and “Lemurian Men”, and the two ‘L-M’ terms are interchangeable, talking about the same group. The Lemuria talked about here is very likely what the Cayce Readings referred to as the “Rama” empire. This group would therefore have colonized land in India. Indeed, their knowledge and battles are still preserved in the ancient Vedic scriptures, still considered central religious text in the Hindu faith. In the oldest Vedic scriptures, you read about flying craft called Vimanas, a vicious war with an opposing faction, sections that almost certainly suggest the use of nuclear weapons in conflict, et cetera. I did an exhaustive summary of the physics in the Vedic scriptures in Chapter 14 of the Science of Oneness. Since Lemuria is also reputed to have lost land in the great flood, they may have also colonized other island areas in the Pacific that sank, like in the legend of Atlantis. However, the Pacific basin is a huge, empty wasteland that is largely free of any submerged areas that COULD have been giant island continents before. Therefore, I propose that the Lemurian empire was largely centered in India, China and the Indonesia / Phillipines island chain. Since most civilizations form on coastal regions, there could have been great loss of life and many major cities by a sudden rise in sea level. They may have also had land off the west coast of South America, as per another Cayce reading. Graham Hancock’s work, such as in “Underworld”, reveals sunken ‘megalithic’ (giant stone) architecture around the coast of India. That could explain how the legend of Lemuria ‘sinking’ came about. Too many coastal civilizations. 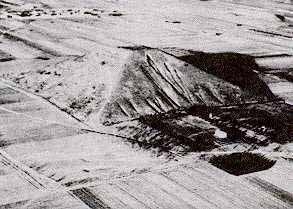 When we also consider Hartwig Hausdorf’s research that there are ancient pyramids in China, in the Shensi province, which first broke on the Laura Lee website, the breadth of this formerly vast civilization becomes clearer. Someone went in and stripped the copyright notices out of Laura Lee’s photographs, and these versions have now widely circulated on other websites. Chris Maier of the Unexplained Earth website actually traveled there and independently snapped his own photographs of the pyramids, which you can see and read about here in an article from 2004. We never directly hear what “S-M” stands for, but given that the ‘L’ stood for the very simple word ‘Little,’ the ‘S’ is very likely quite simple as well. My educated guess is that it stands for ‘Space’, and all the evidence supports that. The Atlanteans clearly seem to have colonized the Moon and perhaps Mars as well, so when the island sank, you can bet that not all the insiders perished. To the extent that the Sumerian cuneiform scriptures may be an inheritance from those who survived an Atlantean catastrophe, the “S” may also refer to “Sumerian-Men” — however, it seems the survivors predominantly relocated in space and only shared limited knowledge with those on Earth, who were in a primitive state after the Great Flood. There is at least one passage suggesting that BOTH of these rival groups started out as advanced Earth civilizations — namely Atlantis and Rama. We are then led to infer that the war-making Atlanteans migrated into space, hence “Space-Men.” The notes say the S-M were grabbing asteroids, obviously with large and powerful ships, and hurling them at the Lemurian / Raman settlements, forcing them to go undersea to avoid the attacks. The technology of either group was more advanced than our own, and this included the ability to displace the weight of untold tons of ocean water so they could safely live under the sea. A robust anti-gravity technology would certainly not exclude this possibility. The weirdness is further increased as we find out that the Lemurians apparently experienced adaptive genetic mutations as a result of being born, living and dying under the sea. Apparently their bodies evolved gills as an adaptation, so they could swim and breathe underwater to some degree. This could be supported by the John Kearns study frequently cited by Dr. Bruce Lipton. If you take bacteria that cannot digest lactose and put them in an environment where lactose is the only food source available, they will actually genetically alter their own mouth-parts to be able to consume lactose. Hence, our DNA is an antenna that allows for adaptive mutations if we are put in an environment requiring new attributes for survival. The movie “Waterworld” concludes with the surprise twist that Kevin Costner’s character has evolved gills after a massive flood wiped out most civilizations on Earth. It could very well be that future generations of the same insiders who wrote the margin notes in this book were responsible for making this huge-budget film. “Waterworld” takes on a very different ‘spin’ if you figure that rather than being a story of our future, it is a story of our past — a small group of people who survived the Atlantean “great flood”, as well as showing how some of them may have evolved to live under the sea. I know, I know… now you’re actually going to have to go see the movie. Sorry. I apologize for this being cut short. The above was written before my last (and final) blast with poison ivy symptoms this week. I finally discovered I had been catching it off of the foam steering-wheel cover on my car. It all came back again last Saturday on the perpetually-healing areas of my skin that are weak. So as a result, typing has become an impossible chore. Once I get better I’ll update this section as there is definitely more! I’m happy to report I conducted a major video interview with Bill Ryan and Kerry Cassidy of Project Camelot, and it will become a ‘viral video’ anyone can watch on YouTube or Google, laying out the case. It would be nice if it helps trigger new witnesses coming forward, including someone who could help us explain these mysteries.